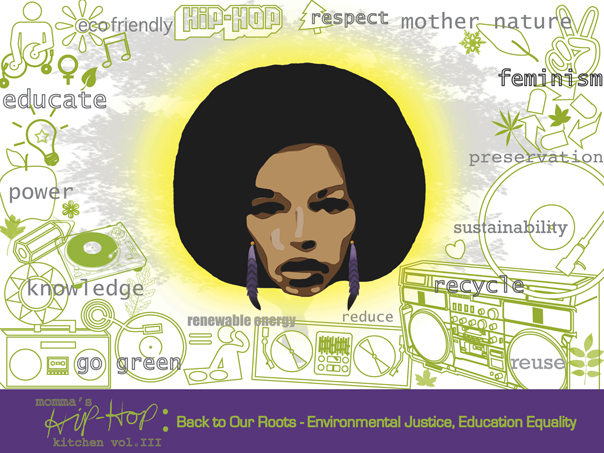 Momma’s Hip Hop Kitchen Volume 3, Back to Our Roots, will be honoring and celebrating 100 years of the International Women’s Movement by shedding light and creating awareness on Environmental Injustices and Educational Inequalities and their impact on women of color. Momma’s Hip Hop Kitchen will bring together women of color educators, students, environmentalists, djs, emcees, bgirls, poets, visual artists, dancers, healers, pastors, organizers and activists. We will come together through a hip hop showcase to express our solidarity with women’s rights! This event will take place in the South Bronx, the birthplace of Hip Hop, and the poorest congressional district in the nation, also called “The Forgotten Borough.” In reality, the borough of the Bronx is not forgotten because one of the wealthiest neighborhoods in the city, Riverdale, lies just northwest and has every amenity a human can ask for. Hostos Community College will be hosting the Momma’s Hip Hop Kitchen event for the second year in a row. Hostos Community College was created in 1968 in response to demands from the Latino community who were urging for the establishment of a college to serve the people of the South Bronx. Hostos was the first bilingual higher education institution in the United States. The South Bronx is a community that has been in constant resistance, seeking justice in education and the environment. It is a community resisting pollution, asthma, toxic wasteland, and budget cuts for art, music, and gym programs. It is a community that lacks access to healthy fruits and vegetables, adequate health care and after school programs. The South Bronx’s need for reproductive and sexual health education is highly reflected in it’s high levels of HIV/AIDS and sexually transmitted infections. However, the South Bronx is not lost. It has experienced a period of healing through leadership guided by community organizations and collectives. This leadership has lead to the creation of new parks, food coops, recycling programs, and successful cultural community centers. We have won many amazing victories as a community!